American Hot Stuff has been one of the most popular videos on the site. It's even outhitting the Japanese X-Men animation, proving there's only one thing cooler than a slick Wolverine anime sequence....and that's some buffoon mashing his face against a camera lens in 1983 and screaming that the next hit video game is guaranteed to be ET for the Atari 2600. Eventually, the inevitable happened....it made its way to the computer screen of the guy who made the game. Howard Scott Warshaw enjoyed the video as well, and says he doesn't even remember it being made, but that didn't stop me from nabbing him for a follow-up interview. 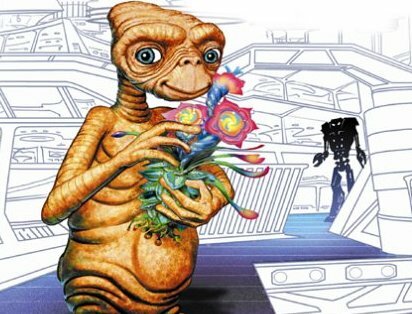 ET is a landmark game for all the wrong reasons, reasons that are also pretty entertaining if you aren't somebody that held Atari stock that year. And if you enjoy tonight's presentation, be sure to catch Warshaw's latest "baby," the DVD Once Upon Atari. It features many, many more intriguing tales of the Atarian underworld than could be printed here. What was up with that tux-shirt?? I can see you and your viewers have a very discriminating eye for fashion. The fact is there's a great story behind that shirt. In my freshman year of college we ate at the Bruff Commons cafeteria (known to its patrons as "Barf" Commons). Once each semester they held an event known as "steak night." On steak night the commons would be decorated to the hilt; a candle on every table and crepe paper as far as the eye could see. My best friend and I were sharing discourse on the appropriate attire for steak night while strolling along the promenade one afternoon....when we came upon the tuxedo t-shirt in the window of a very fine establishment. Simple, elegant and yet sarcastic. We knew instantly it was the very essence of steak night. We bought them on the spot and always wore them to any event we thought rose to the inverted magnificence of "steak night at Barf Commons." How could I not wear it for my interview with American Hot Stuff? Tell us what brought you to Atari. When did you first come to the infant game industry, and why? How I came to work for Atari? I can sum it up in one word: begging. The fact is I was a wild man at Hewlett-Packard where I was working at the time. So much so that a co-worker of mine used to go home and tell "Howard" stories to his wife about my antics. One day he told me she was never very amused by the stories because things like that happen all the time where she worked. I asked where that was and he said "Atari." The next day I called Atari and asked if I could come in to interview for a job. The interviews went well, I thought, but in the end the hiring manager told me they just couldn't work it out. The truth was they thought I was too straight to work at Atari, which is really funny in retrospect. I just wouldn't take no for an answer and literally started begging him for an opportunity to prove myself. They finally relented when I offered to take a 20% cut in pay just to get in and start working there. Never underestimate the power of earnest pleading combined with selling out! This is interesting because I figured even back then with simple machines like the 2600, you needed prior experience and education before diving in and making games. How did you transition from Hewlett-Packard to Atari? The transition was wonderful because I wasn't really a Hewlett-Packard kind of guy trying to adapt to Atari, I was an Atari kind of guy stuck at Hewlett-Packard. And you're right, ordinarily you would prefer experienced people when hiring, but there really weren't any experienced people on 2600 since Atari was the only place in the world you could program that chip. However, I did have a good deal of experience programming microprocessors from my graduate work at Tulane, which did constitute relevant experience on some levels. As we've heard, in its thriving days Atari was a crazy place. Do you have any time to share a few stories? So many stories, so little time. There really were an incredible number of stories because nearly every day we were trying to think of something new and unusual, so we would behave in unusual and odd ways to trigger some new thinking. Playing bocceball with lemons in the hallway, playing demolition derby in the parking lot with remote control cars, getting caught in the hot tub with security guards, flying the frog, and of course the sprinkler-lobotomy story. The sprinkler lobotomy is an amazing tale about how Todd Fry, who used to actually walk along the walls by putting one foot on each wall and climbing up, actually got so high up that he literally split his forehead open and had to be rushed to the hospital. It took longer to convince the hospital staff what had happened than it did to treat his wound. But in the final report, they actually wrote �Programmer injured while climbing the walls.� That was memorable. Stories about getting your first really big royalty check and going out and buying cars are also pretty cool. When I was doing Raiders of the Lost Ark, I actually went out and got a leather hat and a 10-foot bull whip to get into character. I used to sneak around the hallways at times looking for new, unsuspecting visitors from marketing or management. I would sneak up behind them and crack the whip (which was amazingly loud, like a gunshot). They would jump out of their shoes, then turn around and see me standing there with the bullwhip and they didn�t know what the hell was going on. When they got back to their office they would tell a co-worker �I went over to engineering and there is a maniac loose over there with a whip!� and they would hear, �Oh, you met Howard.� When visiting news crews would ask what the whip was for, I would always tell them, �The whip is for R&D, research and discipline.� It was a pretty wild place. On your website, there's a photo of you with Steven Spielberg. What was that about--when did this meeting take place and what was it for? Was he giving you input, or was this just for general approval of your ideas? And has he called back to demand a reissue of ET with the soldier's black gun pixel replaced with a�gray walkie-talkie pixel? 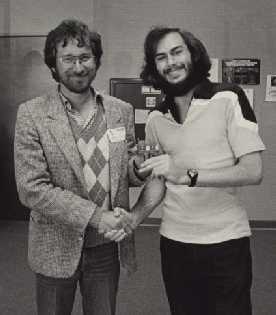 That picture was taken in 1982 when I had just completed Raiders of the Lost Ark and Spielberg had just approved it. I�m handing him a personalized version of the game, where on power-up you see the name �Steven� in the inventory display. There really wasn�t a lot of communication between us during the development. He would come up to Sunnyvale occasionally and sometimes we wouldn�t even look at the game. We would just have lunch together and talk about interesting things. Like the time I explained to him my theory about how he is an alien. I told him I thought he was part of an alien advance team that was preparing Earth to receive visitors. I figured the aliens would send an advance team to make people on this planet more receptive to aliens by creating alien-positive media and disseminating it all over the planet. Spielberg was the production end of it and the marketing dudes made sure Close Encounters and E.T. got seen in every country and in every language on the planet. He liked that so much that he told a gaming magazine about it and they called me up to get the story. I got quote of the month in the next issue. Unfortunately since I finished E.T. I haven�t heard from him, which is too bad because I would really like to talk to him. In fact, there is a subliminal message in the Once Upon Atari DVD that is aimed specifically at Steven Spielberg. We�ll see if he picks up on it some day. Atari picked up the video game rights to ET late, and wanted the game done in a very short amount of time to hit the 1982 holiday season. You were given a mere five weeks to make ET. You've told this story before, but how did you go about putting together a solid (by the definition that it responds to the joystick) game in that short a time crunch? That�s right. It took Atari until late July to get the rights and the game had to be done by September 1st to make it in time for the Christmas market. So with only five weeks to make a game it was a tight squeeze, particularly since no one had ever done a game in less than five or six months before. But it is an issue of design. What I did was design a game that could be done in 5 weeks. And yes, it certainly did respond to the joystick, but it also was a completed, functioning, and for the most part debugged game that played on a three dimensional world with some innovative components. It was a full video game but the thing it lacked the most was tuning. If I had the chance, the first thing I would change about it is the pits. I would make it harder to fall into the pits. If I would have had a few more days for tuning it would have been a much better game. But the fact remains that even after accounting for returns it still sold over 1 million copies and the other thing is that we are still talking about it today. ET is frequently rated as one of the worst games of all time. Now I�m not sure if that�s true, but I never want that contradicted because Yar�s Revenge is frequently rated as one of the best games of all time, so with ET being the worst it means that I have the greatest range of any game designer in history. Heh. Any closing thoughts on the Atari era? While at Atari I did Yar�s Revenge, Raiders of the Lost Ark, E.T., and a game that was originally called Saboteur--then was modified to be the A-Team game and then was ultimately released 20 years later as Saboteur after all. It was a crazy place, and the craziness continued until the downfall of the industry through late �83 and �84. It was wild and got even wilder in many ways when Warner took over and the big success started rolling in. But after a couple of years things got a little too out of hand as the VCS started showing its age and some of the deals made under the Warner regime began to sour. The coup de grace was definitely when the Tremiels took over in mid �84. Clearly things were dying for a while leading up to that moment, but the day they told us Jack Tremiel bought the home game and home computer divisions is the day Atari totally died for many of us. Still, it was an amazing ride while it lasted. For many of us it was the most amazing time of our lives. OR, HOLD YOUR MOUSE OVER HIM TO READ HIS MIND!! FEAST YOUR EYES ON THIS YOUTUBE MUSIC VIDEO BASED IN THE LANDFILL WHERE MILLIONS OF ET CARTRIDGES ARE BURIED!